When a restaurant refers to itself as a “salad bar”, you know that the emphasis is going to be on greens. 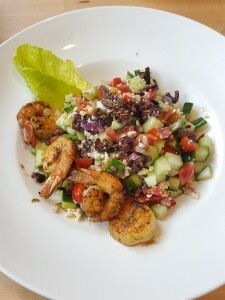 We made two recent visits to Vinaigrette, sampling six different salads. Entrée salads are the focus of the menu but rest assured, this is a complete meal and you won’t go away hungry. The Eat Your Peas salad (pictured left) is listed under the Savory section of the menu. 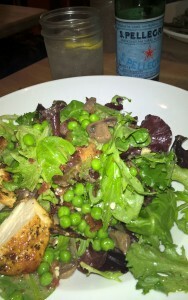 Baby lettuce and sweet green peas with crunchy bacon and a white mushroom sauté. Each entrée salad on the menu has a recommended protein add-on such as Hibiscus-cured Duck Confit, Seared Diver Scallops, or Grilled Tofu. I ordered mine with Lemon-Herb Chicken which was very nicely seasoned and served perfectly done. Getting a salad from kitchen to table with the greens still nicely chilled and at the same time the hot portion of the meal still warm takes some culinary coordination. Vinagrette seems to have that down pat. Under the Bright & Zippy grouping of the menu you’ll find a pretty classic Greek salad (pictured right). Topping all the ingredients you expect to find in a greek salad is a very nicely balanced vinaigrette dressing. The suggested protein add-on for this entrée is their Cilantro Lime Shrimp. In addition to over 18 entrée salads, there are sandwiches, soups, sides, deserts, a good selection of beer & wine, and some very creative cocktails that pair surprisingly well with the salads. My favorite was the gin and tonic made with cucumber, chlorophyll and Hendriks Gin, a very lightly green tinted drink with a pleasantly cool taste profile. We are always on the lookout for how suitable restaurants are for our many guests with food allergies or for those who just really like to have things prepared their own way. Vinaigrette was very accommodating of our special requests. The waitstaff were well informed with details of ingredients for each dish and they made sure to check with the kitchen when they were uncertain about specifics. Most dishes can be easily modified for diners who are vegan, gluten free, or paleo. The owner, Erin Wade, already has two very successful locations in Santa Fe and Albuquerque, so when she announced she would be opening her new Austin restaurant nearby it was the talk of the neighborhood. The location she chose was formerly the site of a somewhat iconic local restaurant that was in need of redevelopment. The way she handled rebuilding on the site was quite thoughtful and managed to keep some of the existing architectural elements as an homage to the previous establishment. Notably, it retains and incorporates a very large old tree which is the center focus of a wonderful outdoor patio. We certainly have some grand old trees here at The Fairview, but the tree at the Vinagrette patio is truly majestic. The building is clean and neat with plenty of parking, although our guests and other South Congress visitors can easily walk there. Something that caught our eye is that all the produce is (or will soon be) sourced locally from a farm in nearby Bastrop. The original Vinaigrette salad bar restaurants get their produce from Erin Wade’s 10-acre farm in Nambe, New Mexico. Her commitment to local, natural, organic food and sustainability is something that we at The Fairview can completely relate to. It shows in the quality of the food as everything is fresh, crisp and tasty. Vinaigrette is an easy walk from The Fairview. If you enter the address, 2201 College Avenue, into your phone you can pick your own route. Maybe you want to wind along the natural scenic path through Stacy Park, or since most of you will be exploring South Congress Avenue anyway you can walk along Congress heading south and do some shopping along the way. But if you’re in a hurry to taste some of their unique and healthy creations, the most direct route is Right on Newning from The Fairview for about 0.6 mile, turn Right onto Terrace for a short block, then Left onto Brackenridge for 1/10 mile, and finally Right onto E Live Oak. You will see Vinaigrette another 400 feet along on your left. We hope you will check here again for more of our Fairview Recommends posts. Until then, Eat Your Greens!